This Full of Love diamond heart ring in white gold from Apples of Gold Jewelry offers a romantic look with two favorites - a beautiful heart shape and a single, glittering diamond, all designed with a white gold band. Choose from 10K, 14K, or 18K white gold, with a unique heart design and a band with a bit of a twist. The cut out heart shape is tilted by a small amount, adding extra personality to this beautiful ring. The diamond, which is nestled in the center of the heart, is 0.06 carats and is rated G-H for color and I1 for clarity. 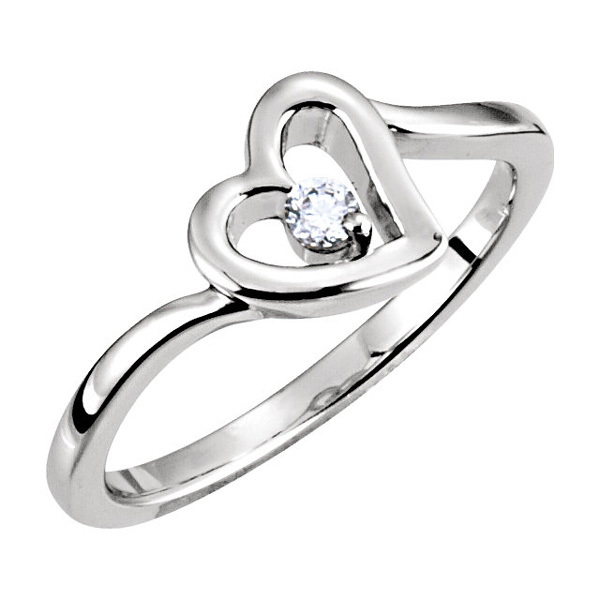 We guarantee our Full of Love Diamond Heart Ring in White Gold to be high quality, authentic jewelry, as described above.